Cat® switchgear is versatile, reliable and extremely failure tolerant. Some of the world’s premier data centers and other operations — where mission-critical backup power is essential — depend on them. Switchgear forms an integral part of a complete Cat power system. While the company’s power equipment is easy-to-use, regular preventative maintenance and inspections can provide the peace of mind of knowing your systems are fully functional at all times. In addition, it’s also often a requirement for compliance with various regulatory standards and quality management systems. Gregory Poole offers a wide range of service solutions for all Cat power equipment. 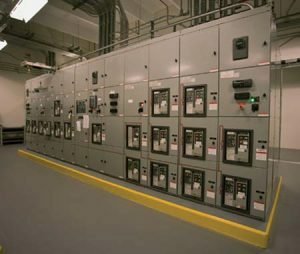 We are the company’s authorized representative for eastern North Carolina and the only place to offer factory-authorized service and repairs for all switchgear and related equipment. If you want to take steps to ensure your backup power systems are working their best, we can help. Contact a Gregory Poole power systems service representative for assistance developing a preventative maintenance plan for your switchgear. We can assess your system requirements and put together a package consisting of regular inspections of your paralleling gear, monitoring gear, peak shaving gear, control centers and other key components. Our technicians have an average of 15 years of experience maintaining switchgear and related power systems equipment. Preventative maintenance is only part of the Gregory Poole difference. We offer 24/7 emergency response in the event that something goes wrong with your backup power system. Employing sophisticated diagnostic tools, we can quickly pinpoint the cause of an outage and correct the issue using genuine OEM parts. We also can provide training for your staff and engineering consulting for any system modifications or upgrades. Working out of our Garner location and offering mobile service to clients throughout eastern North Carolina, we are fully equipped to meet your repair and maintenance needs. In addition to our factory-trained technicians, we employ five full-time power quality and control specialists who bring the advanced technical expertise necessary to troubleshoot complex issues with your switchgear. Switchgear is an essential part of many Cat power systems. Keeping it working reliably doesn’t have to be a major expense of time or money. Contact Gregory Poole for all of your service needs.